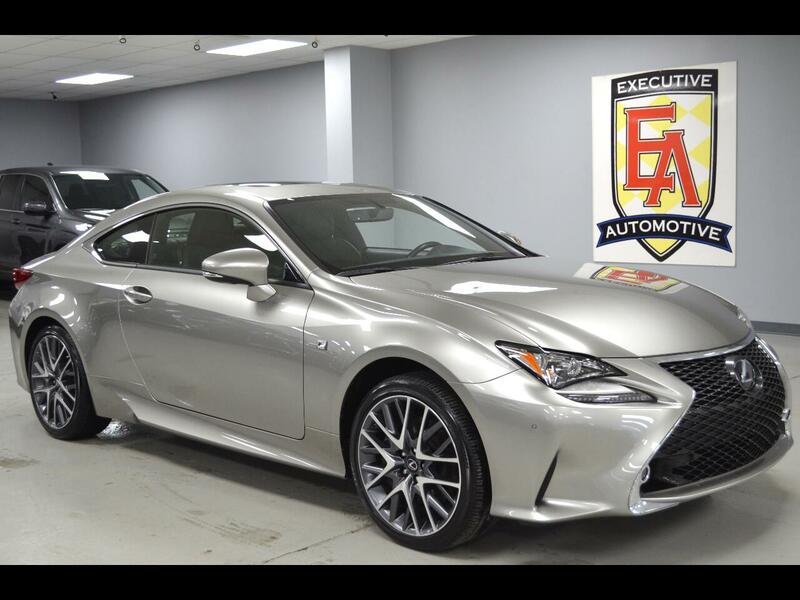 2016 Lexus RC350 F Sport AWD, Atomic Silver with Black Leather, F Sport Package: F Sport Front Bumper and Spindle Grille, 19" F Sport Wheels, Blind Spot Monitor with Rear Cross-Traffic Alert, TFT Instrument Cluster, Heated/Cooled Front F Sport Seats, Perforated Leather Steering Wheel and Shift Knob, Black Headliner, Aluminum Pedals, Silver Performance Trim, Driver Memory Seat, Adaptive Variable Suspension (AVS) and Sport S+ Mode, Active Sound Control. Navigation System/Mark Levinson Premium Audio, Remote Touchpad Control, Voice Command. Back-Up Camera, Power Tilt/Sliding Moonroof, Intuitive Parking Assist, Dynamic Radar Cruise Control with Pre-Collision System, Rear Lip Spoiler, Keyless Entry, Push Button Start, Multi-Zone A/C, Fog Lights, Bluetooth Connection, HD Radio, Auxiliary Audio Input, CD Player, MP3 Player, Steering Wheel Audio Controls, Auto Dimming Rearview Mirror, Driver Adjustable Lumbar, Auto Leveling Headlights, Power Windows, Power Locks, Power Mirrors, Power Seats (both), Power Tilt Steering and more! Contact Kyle Porter at 816-616-2500 or email kyle@executiveautomotive.com for additional information. Thanks for your interest in our RC350 F Sport! Message: Thought you might be interested in this 2016 Lexus RC 350.